They are very similar looking to the dolphin. However, the way to distinguish them generally is from: their smaller size; they have a rounder body shape and they lack the ‘beak’ of the better known dolphins. Porpoises are among the smallest aquatic mammals. They are related to dolphins and whales and belong to the same order, Cetacea. Different types of porpoises include the Common or Harbour porpoise, which is dark coloured on back and white underside, for camouflage in coastal waters and is similar to the Californian porpoise; Dall’s porpoise, which has a slightly more muscular body, they are jet black on back with white patches on the belly and flanks; Burmeister’s porpoise, which is dark overall, the Dorsall (back) fin has a sharp point with ‘teeth’ on its leading edge; Finless porpoise, which are grey overall, except for paler throat and face, they have a rounded, blunt head and no dorsal fin; the Spectacled porpoise, which is blue-black on back and white on sides and under-parts, they have a rim around their eyes which resemble spectacles. Porpoises are thought to have emerged as a group of aquatic mammals about 15 million years ago, when they were confined to the north of the Pacific Basin. From these beginnings they slowly evolved into the total of six species of porpoise alive today. They are sociable creatures and are often found in groups of 2-20, but usually about 4. They are sexually mature by the age of 4-7 years, according to the species. mating season is summer in the northern hemisphere. Gestation is 11-12 months and they have 1 young. Young calfs are born half the length of the female and has to be brought to the surface immediately to take its first breath. The female often swims on her side as she suckles her young calf. In this way they reach the water’s surface to breathe at the same time. This only happens in the first few days after birth, and soon the calf surfaces independently and dives to resume feeding. The young often remain with its mothers after being weaned. The Dall’s porpoise is known to be the fastest of all the porpoises. It powers through the water at speeds of 20-30km/h. It is also famous for its ‘rooster’ spray – a stream of water that arcs up over the head as it reaches the water’s surface. They are the most sociable and are attracted to moving ships. The Finless porpoise, as its name suggests, has no dorsal fin. The females have been known to carry her single young, or calf, on her back as on a saddle. Porpoises have between 60-120 teeth which are flattened into a spade shape at the tip. 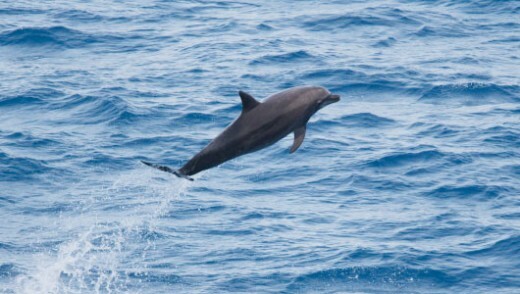 The common porpoise makes a distinctive, explosive noise as it comes to the surface to exhale. It has also been called a ‘puffin pig. Similar to the dolphin, the porpoise have a wide repertoire of communication calls, including ‘clicks’ used for echo-location. Their greatest threat to population is fishing nets and pollution. Some species are thought to be declining as a result. Another hazard of inhabiting coastal waters for the common porpoise is that it can get stranded on beaches. Diet: Carnivore. Varied: Crustaceans, squid and many species of fish. Habitat: Oceans. Mostly near the shore. Also some freshwater populations of the Finless dolphin.